Nipsey confirms the exciting news during his appearance on Los Angeles radio station Real 92.3. 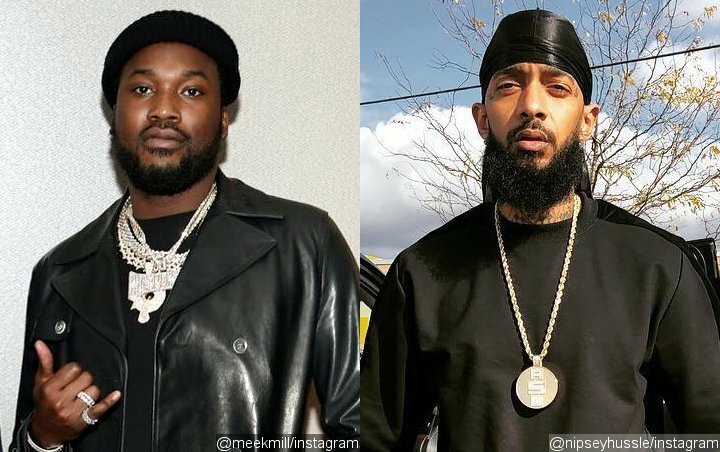 Rappers Meek Mill and Nipsey Hussle have been hitting the recording studio to work on a joint album. The “I’m a Boss” hitmaker previously voiced his interest in working with Nipsey in December (18), and now the two stars have started to turn that dream into a reality. Nipsey recently confirmed the news during an interview on Los Angeles radio station Real 92.3, revealing they are aiming for a summer release. Nipsey isn’t the only rapper Meek has been in the studio with – he is also lining up a track with J. Cole. It’s not known whose next album the Cole song will feature on, but Meek has been working hard on a follow-up to his 2018 comeback album “Championships”, his first full-length release since walking free from prison last April (18) after serving time for a probation violation.